As anyone following the observing campaign will realise, it has not gone quite as expected… The lightcurve remains flat and without any hint of the ~30%-deep eclipse we predicted. To be frank, we got it wrong. We can now say that the eclipses seen in 2008 & 2011 around PDS 110 were not made by a periodic object, or at least, not one with dust that stuck around over 6 years. And we can say that thanks to the many fantastic observations from amateur and professional observers alike! So thanks very much for that. Professional observers: We can no longer expect you to contribute data. I’m sure your telescopes have other, more important targets that can be observed. Professional survey telescopes such as ASAS-SN will of course continue to monitor the star. 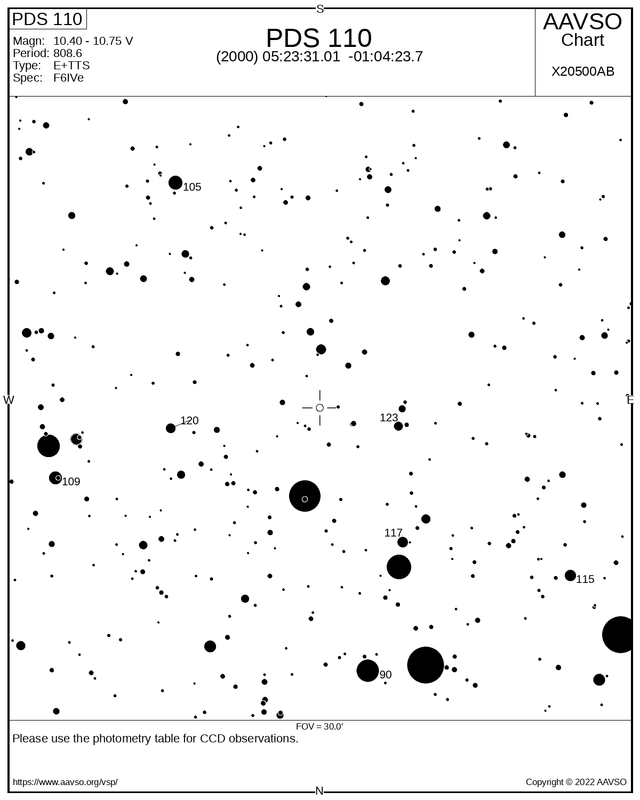 AAVSO: Voluntary amateur observations of the star will, we hope, continue. We still know this star has random (and probably aperiodic) eclipses which would be fantastic to observe again. The paper: There will be a paper, submitted in the next couple of months, detailing the lightcurves and the null result. All significant contributors of data will receive co-authorship. For professional observatories, this includes the list of original contributors to the facility (I will chase these up once I have the data). Data: Rather than re-reducing many disparate image sets, we request reduced photometry. Either uploaded to AAVSO, to the google doc, or by email. Please upload photometry in the next couple of weeks, so we can analyse the whole dataset together! What did cause the eclipses is still somewhat unclear, and I’m sure the observations taken have improved our knowledge of this mysterious young star greatly. Once again, thanks for your contributions. Thanks especially to the largest AAVSO observers – G. Myers, C. Lopresti, J. Hambsch, U. Quadri & M. Deldem. And professional contributors M. Mallonn, J. McCormac, R. Sfair & A. Scholz. PDS 110 is a young star in Orion. We see evidence that a dust-enshrouded body eclipsed the star in 2008 & 2011, and believe it will do so again in September 2017, and we need you to help us monitor it! Click here to see the latest lightcurve from our 2017 observing campaign. We need astronomers across the world to detect and study the eclipse of PDS 110! 200mm (7″) to 1m (40″) is ideal. Having a CCD & being robotic both help! Then you may be able to help us! We are teaming up with the American Association of Variable Star Observers (AAVSO) to coordinate the observations. We have reason to believe that there is sharp structure in the eclipsing material. This may even be exo-rings aroung a young exoplanet (similar to the eclipse of J1407, modelled on the right). However, because of the position of PDS110, we cannot observe the brightness of the star for more than 3 hours from a single location. Only with multiple observers can we achieve the near-continuous photometry needed to map this elusive object! Orion (and PDS 110) is observable across the world for between 1 and 3 hours before dawn each morning. We expect central eclipse to be around 14th of September (plus or minus one week). Until a dip begins, one or two measurements per night is sufficient. If and when the eclipse starts, we may ask for increased cadence (sign up below for “triggered” email alerts). We are primarily using the AAVSO campaign to coordinate observations, and expect photometry to be submitted through the AAVSO WebObs tool. Significant contributions of data to the campaign will be given co-authorship on the follow-up paper.